Well, hello there, strangers! Happy 2015 to you all! I’m so excited about this year, and my new plans and goals for my house during the next year, but I thought I’d kick things off by wrapping up some unfinished business from last year. Remember when I shared my finished kitchen with y’all? And remember how I ended that post by saying that I’d share the costs and sources for the kitchen very soon? Well, it only took me two months and twenty-one days, but here’s the info! I was so curious to finally figure out how much I spent on this kitchen, because I really didn’t keep track of it as I was working on it. I just knew what I wanted, I knew what I needed, and I tried to do things as inexpensively as possible. I was hoping I could get it all done for under $10,000, including the cost of new appliances. What do you think? Did I make my goal? 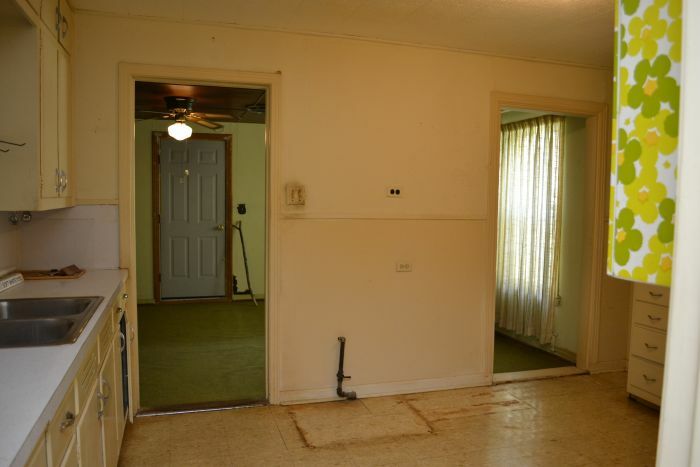 If you’ll remember, this was a complete down-to-the-studs remodel. 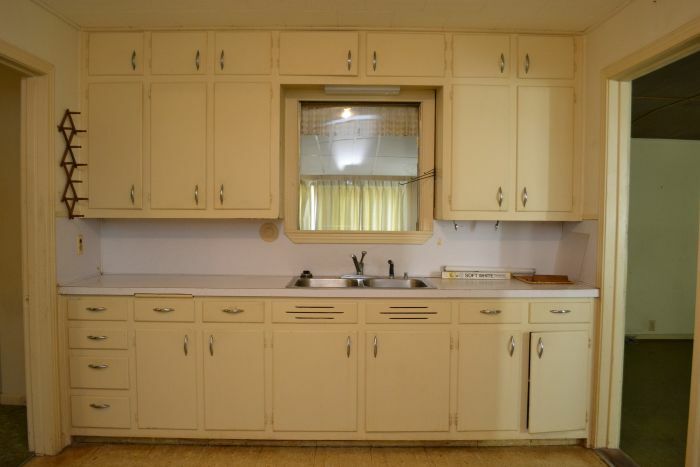 The original kitchen was looking very old and dated, with awkwardly arranged cabinets and appliances that made for a very inefficient work space. 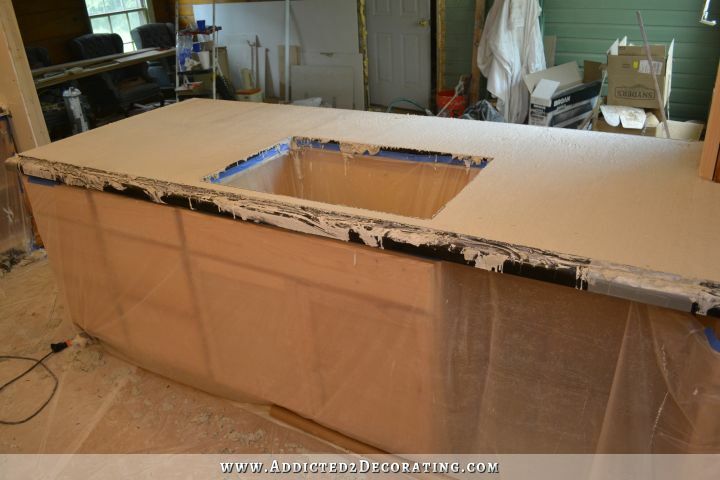 The sink was originally located on this wall, with a window that looked into the sunroom. Then after all new wiring and drywall, I installed stock oak cabinets from Home Depot. I dressed them up with some decorative columns, furniture feet, lots of trim and crown moulding, glass inserts in four of the doors, paint, gold leaf, pretty hardware, corbels, and sconces. The wall opposite that one originally had upper and lower cabinets. All of those cabinets came out, and I just tiled the whole wall. 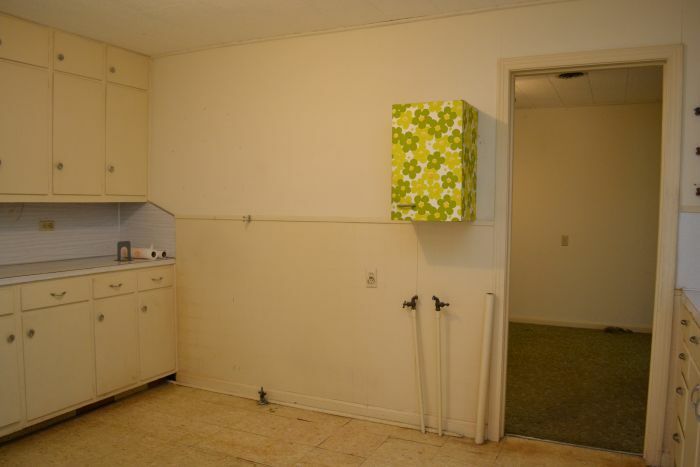 The refrigerator was originally on this wall, along with a portable dishwasher and a single metal wall cabinet. After removing all of the old drywall, adding the new wiring, and installing new drywall, I installed new cabinets on this wall. I built a refrigerator enclosure, and then added furniture feet, trim and moulding, paint, gold leaf, corbels, and hardware. 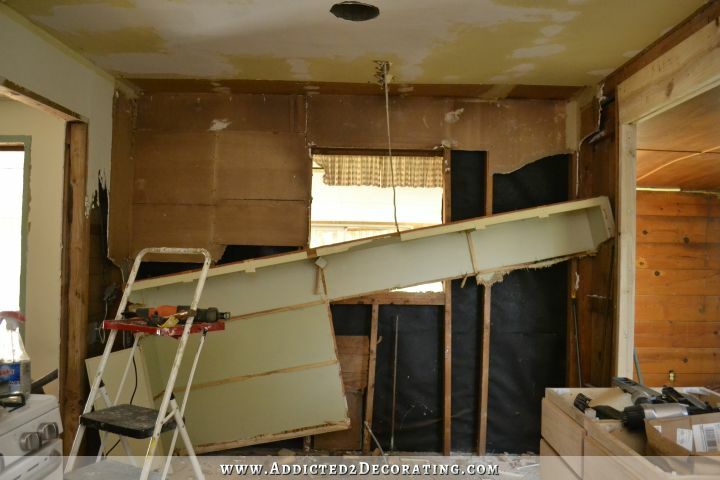 The biggest change was along this wall between the kitchen and the dining room. There was originally a wall between the two rooms, making the kitchen feel very small and cramped. So with the help of my brother, I removed the wall and installed a header. This is where I relocated my sink, and also added a dishwasher. 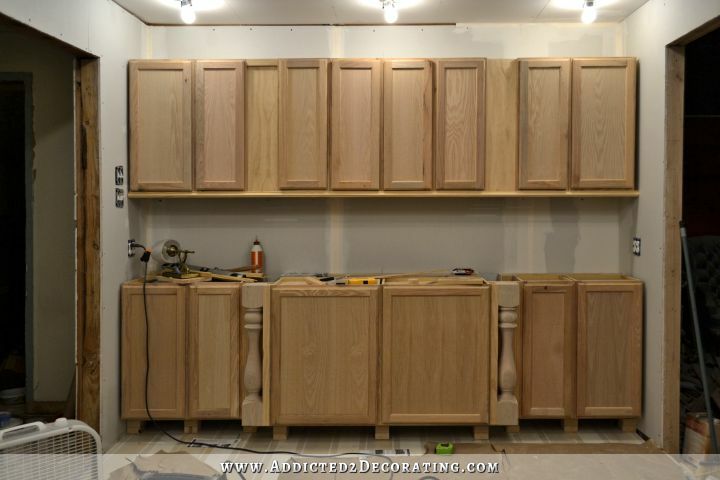 And again, I added all of the finishing touches to turn these stock cabinets into custom-looking cabinets. 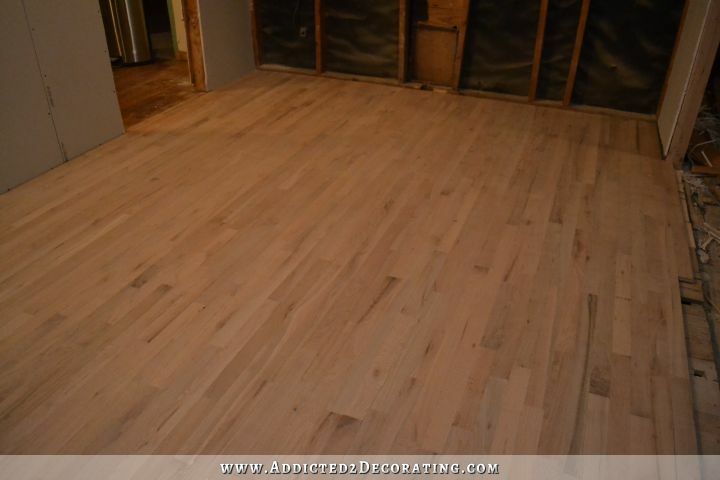 …and installed new hardwood flooring. …my brother came over and helped me mix and pour the concrete. Of course, that’s the very condensed version of this remodel that took me seven months to finish. So how much did all of this cost? And more importantly, did I meet my goal of remodeling my entire kitchen for under $10,000? Yes! I came in just under that goal! Here’s the cost breakdown, as well as the sources, for this remodel. I tried to include all costs, including tax and shipping costs where applicable. I made my goal! 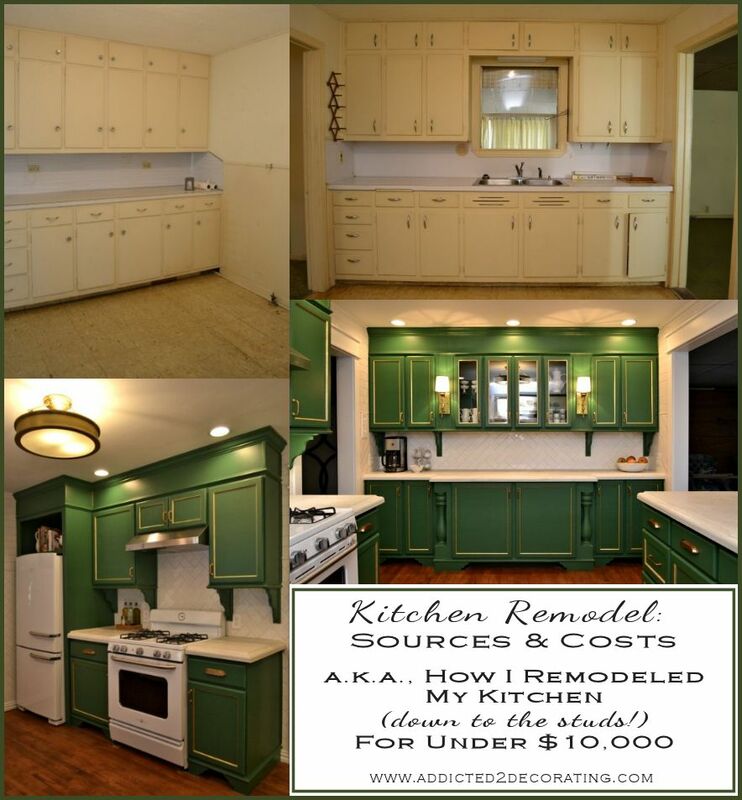 A complete down-to-the-studs (and the ceiling joists, and the subfloor) remodel of this kitchen for under $10,000, including new appliances! It was by far the hardest project I’ve taken on so far, but it was so worth it in the end. I’ve cooked in this kitchen almost every single day since I finished. 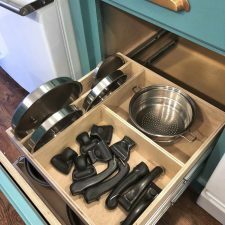 I’ve thoroughly enjoyed cooking in there, and the new efficient layout makes it so easy to use. 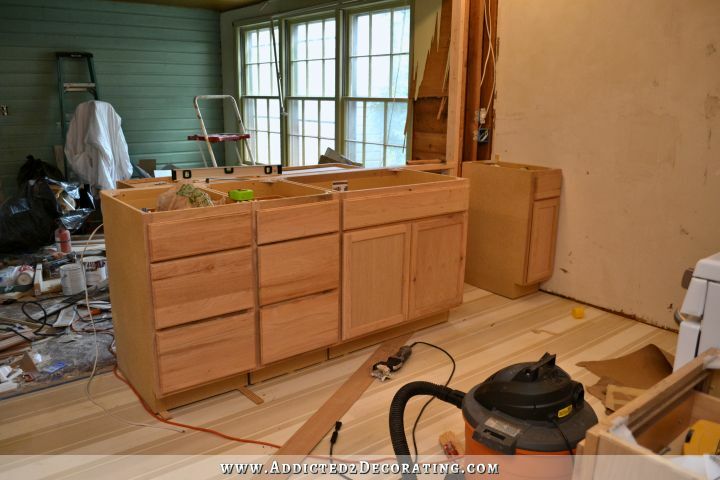 Here are a few of the DIY projects that went into this remodel, just in case you missed them. Some of them made the cut, and others weren’t so lucky, but they were all part of the process. So glad you are back! Happy New Year! Happy 2015 Kristi! Hope you and Matt had a relaxing Christmas and NYE! Thanks for the recap — the kitchen looks beautiful and I could cook in there any day plus twice on Sunday! Can’t wait to see what you are up to next. Welcome back and Happy New Year! I think that’s absolutely amazing that you kept under budget when you didn’t even keep track. Even if you weren’t provided those few free items, it wouldn’t have been all that terrible, considering it was a total gut job. That’s so awesome! Kudos to you! Happy New Year, I’m so looking forward to reading your posts. Happy to read you met your goal for under $10,000. So beautiful! Congratulations!! I just realized I chose the same appliances to go into my new build. Do you like them? I chose them in black and think they look amazing. Just wondered if you have any issues I should prepare myself for. Love everything you do! Nope, I haven’t had any issues. I love the stove. It’s my first time cooking on a gas stove, and I thought it would be a tough change for me, but I love it! I was debating between the gas and electric and went with the gas. So glad you like it. I’m even more excited for my appliances now since I know someone with such great taste has them too! I too am looking forward to the next part of your renovation. PS. How is the diet going? 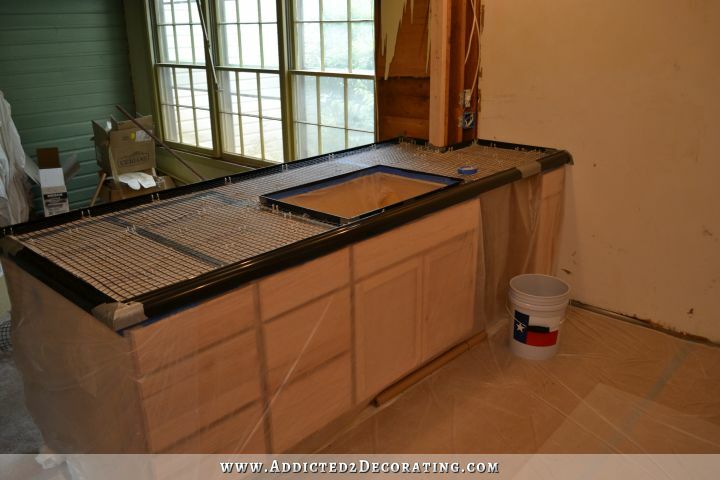 Now that you are working on the concrete counters, what do you think? 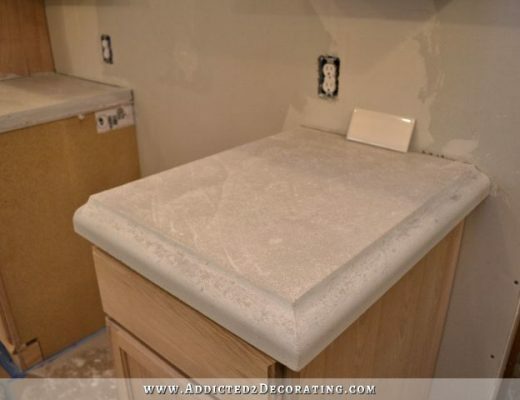 Do you have to worry about stains (either temporary or permanent) like marble? I love having followed all of your decisions last year. Two that stand out to me are the floor and the island. I love your final decisions on both! Welcome back, Kristi, and Happy New Year to you and Matthew! What a difference from Before to After; you have done a remarkable job in both design and execution. I’m so glad to hear you are enjoying it functionally as well as aesthetically, and I’m looking forward to seeing how the living room and dining rooms turn out. Have you put the condo on the market yet? Beautiful job but I don’t know how you could live without the single flowered metal cabinet. Such a period piece complete with MacTac! Happy new year, Kristi. I have missed you and wondered where you were. Your kitchen is fabulous and I can’t wait to see your next projects. PERFECTION! You have much talent and great taste. Welcome back..!! Glad to see you back. Hope you enjoyed your much needed rest during the holidays.. !! Your kitchen is absolutely beautiful and I’m glad your enjoying it after all your hard work..!! Can’t wait to see what you’ll be up to next… LOVE YOUR BLOG..!!! Happy New Year! This is amazing- so amazing. What a transformation! Myself being a cook- is also personally happy it’s getting used! 😀 I’m as excited about you enjoying cooking in it as the actual kitchen remodel itself. Thanks for sharing your progress! Here’s to another amazing transformative year in 2015!!! Congratulations on completing a project on time, under budget and achieving an upscale look to an amazing kitchen. 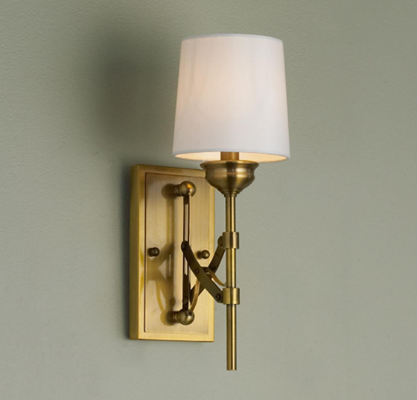 Your choice of color, the gold detail and the lighting just takes it over the top in classiness. I can’t wait to follow your next projects. Congratulations Kristi! That is an amazing makeover for the amount of $$ you put into it. It is such a beautiful room and I’m sure its a joy to cook in there with all your beautiful appliances and storage. I’m looking forward to your projects/blog this coming year and wish you the happiest, healthiest year ever! So glad that you are back. Seriously, it was like going through detox. 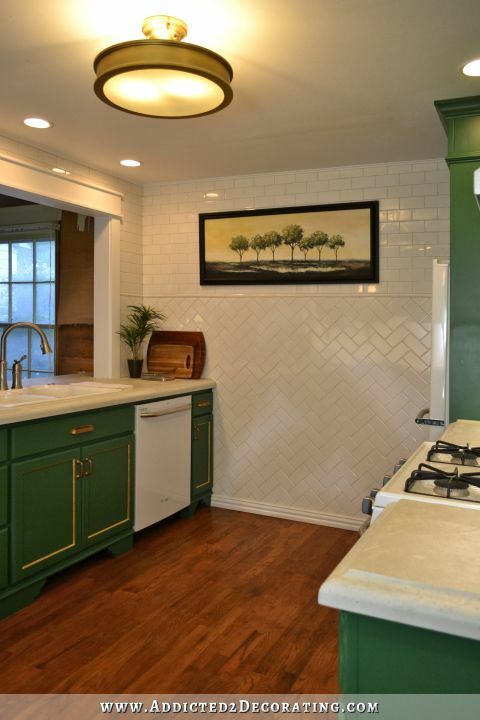 It’s hard to believe that one of the most be beautiful kitchens I have ever seen cost less that $10,000. I never realized how much contractors charge for their labor. 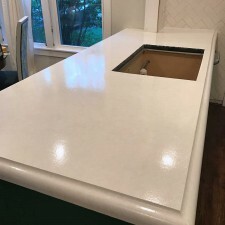 In my opinion that kitchen would have cost at least 3 times what you spent up here in Connecticut if the job was hired out. According to my calculations you now have $59 to spend on shoes. That is the most beautiful kitchen I’ve ever seen! You should be very proud of yourself. Hope you got rested up for your next amazing project. Happy New Year!! Happy New Year Kristi!…Thanks for the break down of your cost for the kitchen. You did a fabulous Job on your cost and make over. It is stunning! ABSOLUTELY BEAUTIFUL!!! When I was in the middle of moving, about a year and a half ago, I stumbled across “Addicted2Decorating” and bookmarked it because I just LOVED what you were doing in your condo! 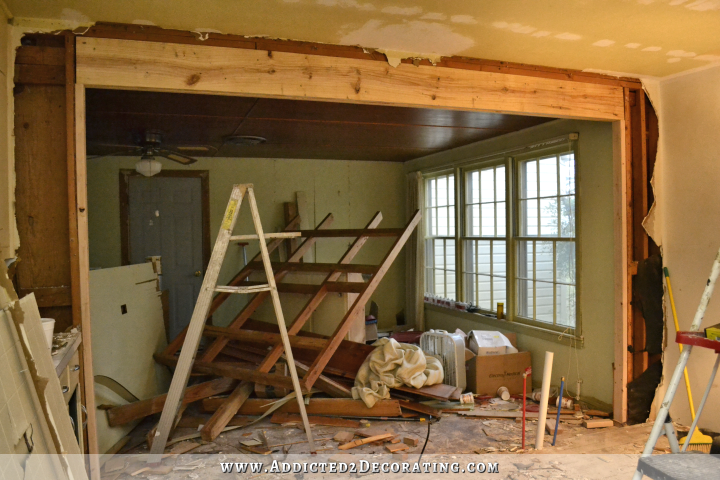 And, even though I was swamped, in the middle of my own renovation of my “new” home, getting my old home ready to sell, etc… I knew I wanted to be able to come back, someday, and go through everything you had done and be able to really drink it in. 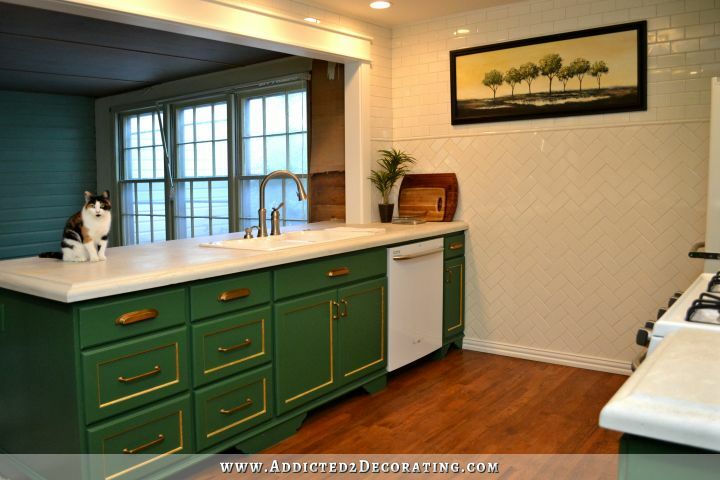 Your kitchen is breathtaking!!! You should be VERY proud. I can’t wait to see your next project!!! I LOVE everything you did INCLUDING how you BEAUTIFULLY dressed up that header!!! I mean, I cannot tell you how impressed I am!!! 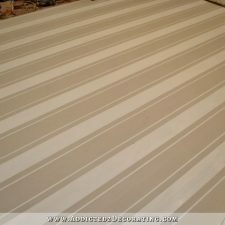 Here’s my question, though…now that you are going with neutrals in your dining room…do you think the off white/taupe striped floor could have worked? Don’t get me wrong, I LOVE your floors that you have now. 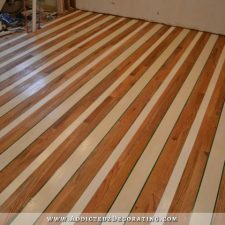 But, I kind of loved the striped floors, too! 🙂 Now I’m wondering if they would have been a cute transition from one room to the other. What do you think? Anyway, thank you for sharing your talents with other diy-ers! I can’t tell you how much I have enjoyed EVERYTHING you have done!!! Happy 2015 to you are yours!!! Beautiful! You are an amazing woman! Job well done! You are amazing. Your kitchen is beautiful as well as functional. I love following your progress. You are such an inspiration. Congratulations…simply amazing. I did a total gut and redo of my kitchen 7 years ago. My mother completed the plans and I bought cabinets that were above stock, but from a Home Depot type store. Yes, it was 3 times that amount, doing so much myself, but enlisting the help of others. 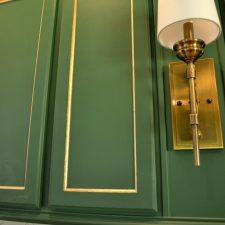 Not wanting to burst your bubble, because this project is INCREDIBLE, but I was trying to seeing the cabinet hardware total and source. Is that included in the cabinet price? I looked 3 times, I may be blind, also! LOVE YOUR WORK!!!!! You are SOOOOOOOOOOOOO gifted! And…determined! FORGET the hardware comment! Just saw it is under pitted cabinet hardware! I should have known you would not miss a beat! Happy New Year Nikki, what a dream job you have created in your Kitchen. I followed it all the way and a Huge Congratulations in coming under budget. Proves it can be done. All the best in 2015 Kristi. I am looking forward to following your adventures, you are my favourite blogger by far! I am so impressed with what you were able to do with that budget! We’re redoing our kitchen (just tore out one wall this weekend and are about to start work on the ceiling to get to modifying the trusses to vault the ceiling next weekend! 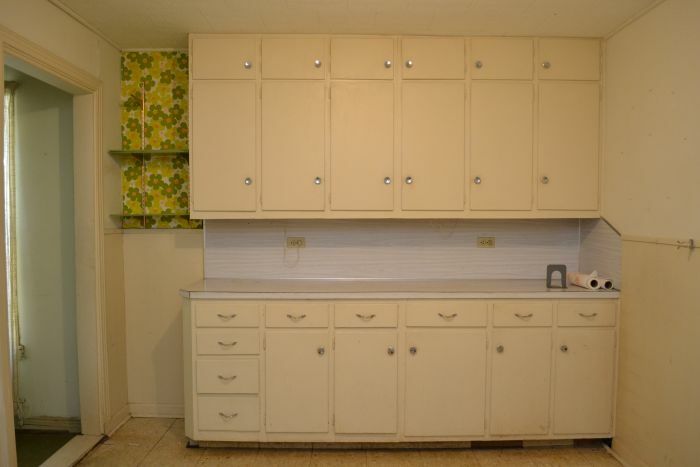 ), and one of the big items that’s still undecided is cabinetry. 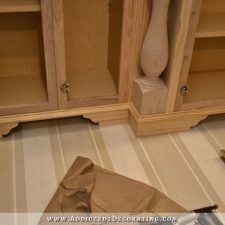 I’m impressed with what you were able to do with the stock cabinets, but when I looked at the stuff in home depot it was all pretty crummy and didn’t look like the joints/hinges/shelves were really meant to be long lasting or particularly easy to customize. 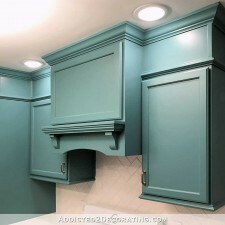 Did you do anything to reinforce or improve your stock cabinets (besides the aesthetics, which are amazing of course)? Happy new year Kristi and welcome back. I don’t think i will get tired of looking at the pics of your kitchen. Absolutely gorgeous! Fabulous! 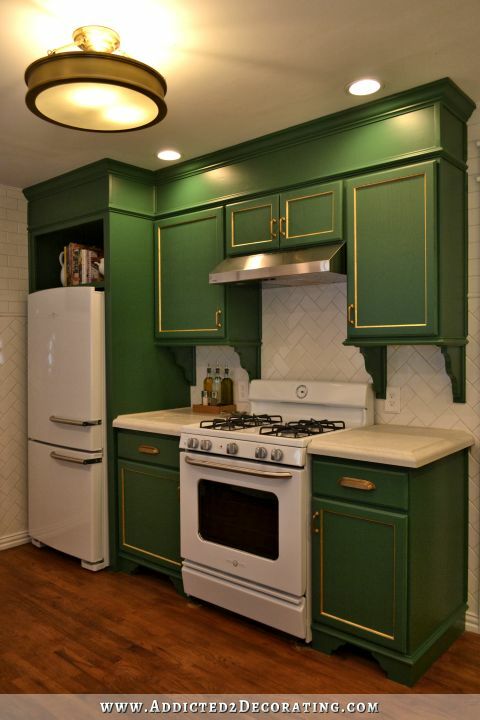 Have you ever considered a faux brass type cover for the stove vent? Great recap and your blog is always so much fun to read! The remodel actually went OVER the $10,000 mark when you factor in the Vitamix that you had to use to fix the concrete counters. 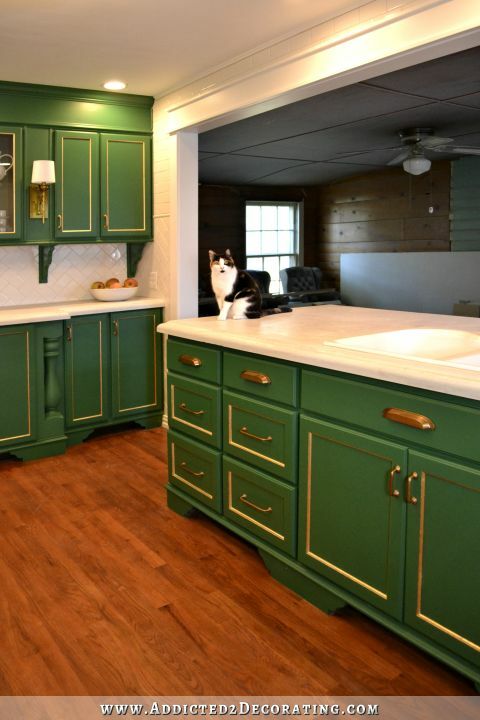 I love how you went bold with the color of the cabinets. Gorgeous. You did a wonderful job. 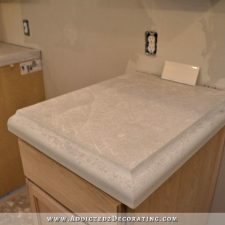 I thought you had marble counters they are so beautiful and then to find out it’s concrete! Amazing. I really enjoy watching your process and progress. You’ve done a wonderful job! The kitchen is beautiful. I’m not sure that I am crazy about the slightly retro appliances in such a sleek, sophisticated kitchen. But opinions are like……. 😉 I love your blog and keep at it! It’s SW Derbyshire, but I had it color matched and mixed in BM Advance paint. Wow! Wow! Wow! I am currently at the beginning of my kitchen remodel and I just about DIED when I saw your kitchen! It is gorgeous! Simply stunning! 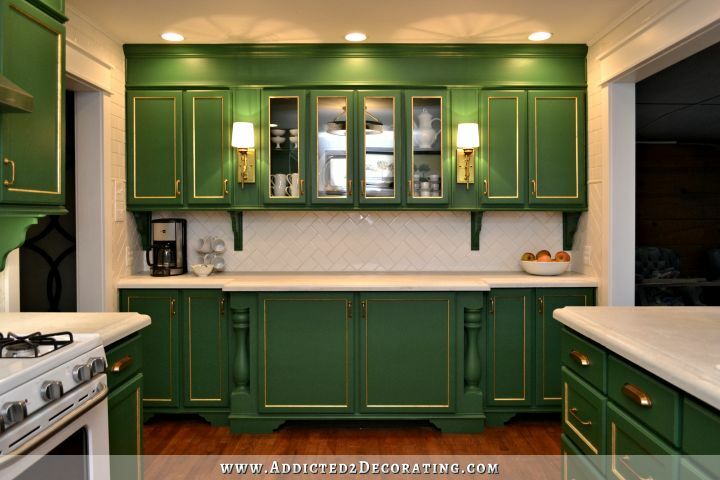 I never in a million years would have thought green cabinets with gold leaf could look so amazing! I am dying over every little detail. You have completely inspired me! Thank you! Can you tell us how you like the appliances? Anything you would have done different there? I love the way they look would love to know how you feel about them after a year of use. I really like what you’ve done. Can you tell me where you got the furniture feet? 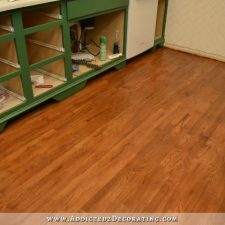 Thanks Kristi for your site on feet for stock cabinets-really helps. 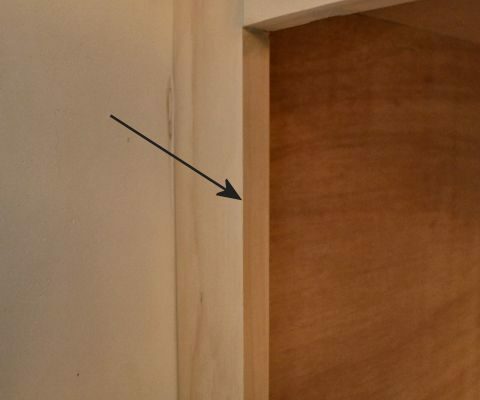 One last question-I’ve also (just) bought Home Depot unfinished oak cabinets for painting and DIY improvement. 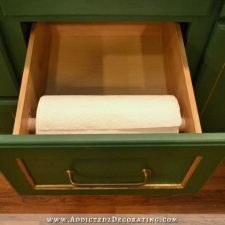 Would like to know why you replaced the Home Depot cabinet doors and drawer fronts with ones from Cabinet Door World please, cause am not thinking of doing that myself- Are the Cabinet Door World doors better/heavier/thicker/more substantial? 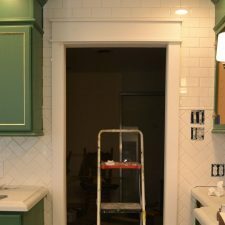 (I just checked out Cabinet Door World site and from the pictures, their flat panel doors and also shaker doors look very similar to Home Depot unfinished oak doors, but I’m assuming Cabinet Door World’s are better in some way?) Thank you! I had to replace some that were accidentally left out in the rain overnight (I had taken them outside to paint) and they got destroyed. The doors that come on the stock cabinets were perfectly fine. The kitchen is fabulous. How on earth did you know how to do this? I wouldn’t know where to start. I so wish I could. you are amazing…do you have a group in Facebook? So many do anymore about redecorating, you could answer so many questions, of course you probably would like to have a life! LOL But you would be great at it. Hi, what a beautiful job! 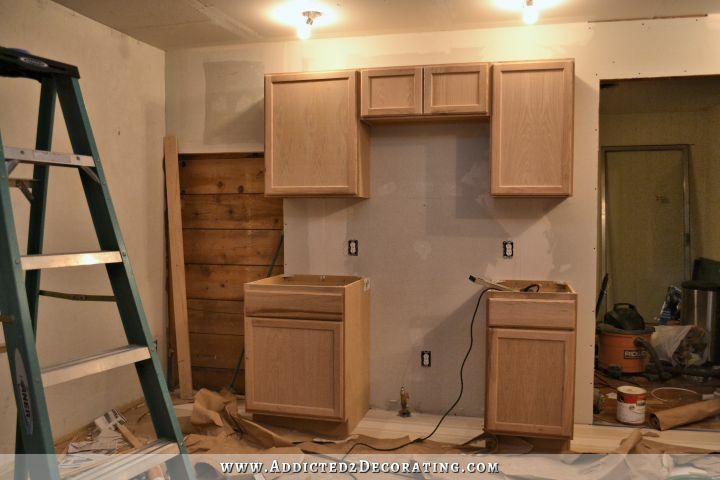 I have the same Home Depot unfinished oak cabinets to install in my kitchen. I would love to paint them Darbyshire Green. I bought the Sherwin Williams paint, but have just noticed your post says you mixed it with Benjamin Moore Advance. I would really appreciate it if you would let me know (1) what color BM Advance you used and (2) the amount/proportion of SW Darbyshire to the amount/proportion of BM Advance you mixed together. Thanks so much and for the inspiration! I intend to use some of the links in your post, including for cabinet doors and legs, and will let them know I got their contact details from you. I had the color mixed in Benjamin Moore Advance paint. You just have to ask them to color match. Hi! 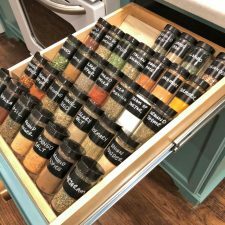 I came across your blog and fell head over heals for your kitchen! Amazingly beautiful. We are currently renovating our soon to be home, and I’m trying to do as much kitchen cabinet research as possible. I’m very curious to know how your cabinets are holding up? Do you have any concerns at all? How would they hold up in a home with small children do you think? Do you mean specifically the paint? I think if you stick with a high quality latex paint, you’ll be fine. That’s not to say that it’ll be perfect. It might need touchups every now and then, but a high quality paint shouldn’t need that much at all. Thank you so much for your fast reply. I was thinking more about the quality of the cabinets themselves. 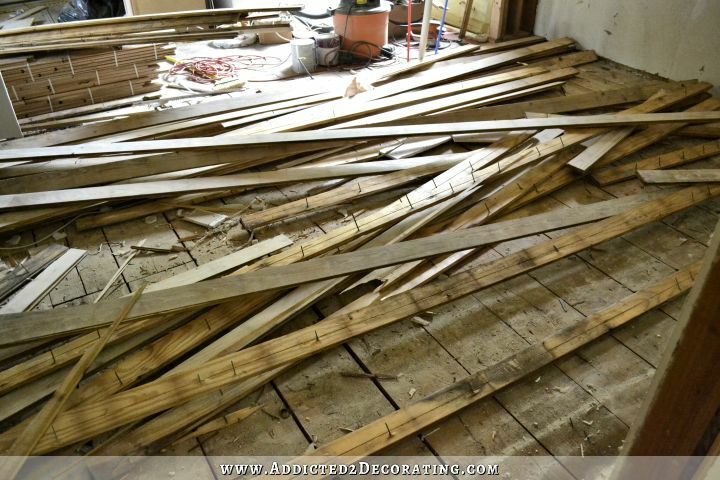 would you pick particle board construction again?